A wheel of Roth's Monroe Cheese, along with some of its smaller, snacking cheese cousins. Contributor Jeanette Hurt offers up a slice of Wisconsin-made Monroe cheese. 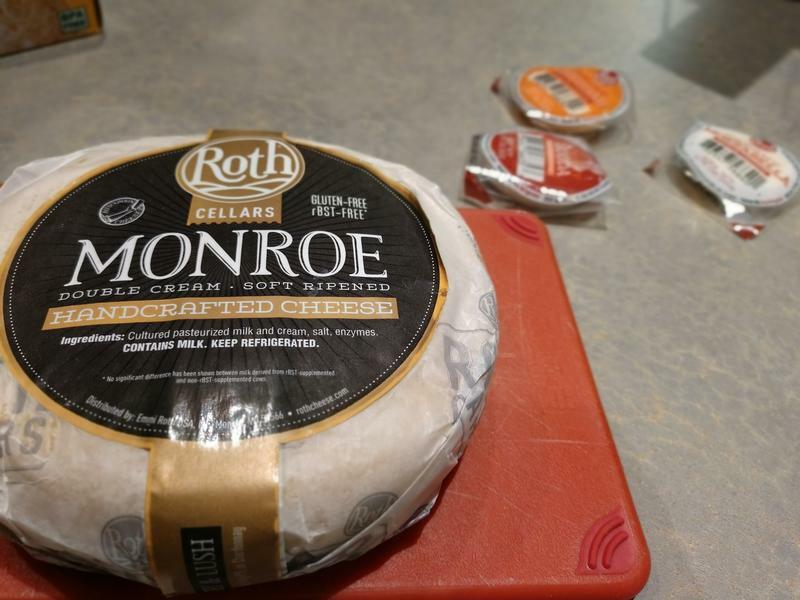 Lake Effect cheese contributor Jeanette Hurt talks with co-host Mitch Teich about Monroe, a new cheese made by Wisconsin's Emmi Roth. It was big news nine years ago when the Swiss dairy cooperative, Emmi, purchased Monroe, Wisc.-based Roth Käse USA. The combined company became Emmi Roth, which makes its own Alpine cheeses in Wisconsin and imports cheese from Switzerland. The company's Wisconsin-produced cheeses have earned world championships, and with them, fans around the globe. So, the company is hopeful its newest innovation will be no less successful. 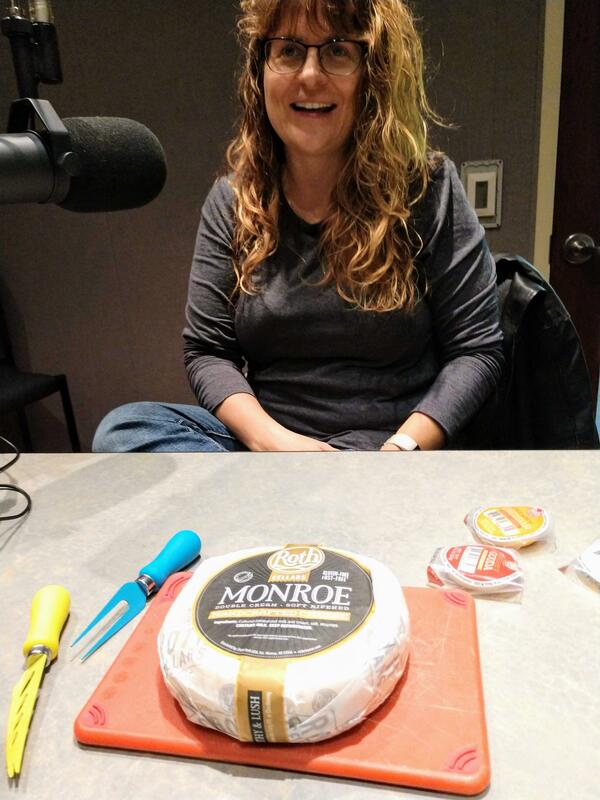 Lake Effect cheese contributor Jeanette Hurt talks about Monroe and some of Wisconsin-based Roth's snacking cheeses in the studio. 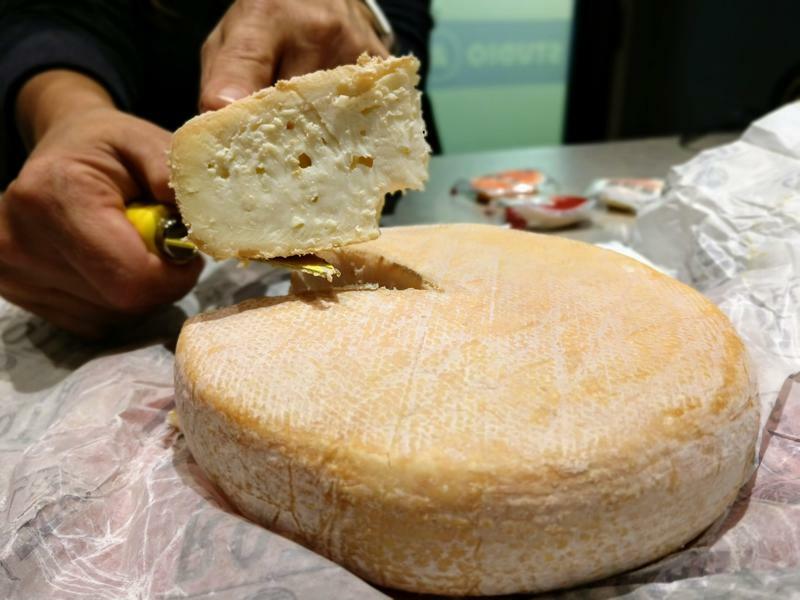 The soft-ripened cheese, called Monroe, has a fan in cheese writer and Lake Effect contributor Jeanette Hurt. "What's really exciting about Monroe is it's the only cheese of its kind being made in Wisconsin," Hurt explains. "It's a creamy, washed-rind cheese — washed rinds are like taleggios, or the famous Limburger. It means they do have some smell to them, because they are washed with a bacterial solution as they age." Fortunately for the faint at heart, Hurt says Monroe does not smell nearly as strong or unpleasant as Limburger, although the longer you store it, the more aromatic it becomes. The flavor, however, is extremely pleasant. "When you taste it," she says, "it tastes really creamy, luscious — it's almost like a double-cream brie." Best of all, she notes, Monroe is a perfect addition to a comfort food many of us turn to in the cooler months. "This cheese," she says, "makes a fantastic grilled cheese sandwich." If you try Monroe cheese: Hurt says the rind is edible, though some people choose not to eat it. "You can cut it off, [but] it tastes just fine, and it's quite lovely." It's available at Whole Foods stores in Wisconsin and at Fromagination in Madison. As you get ready for your Memorial Day weekend picnic or barbecue, don’t forget the cheese! 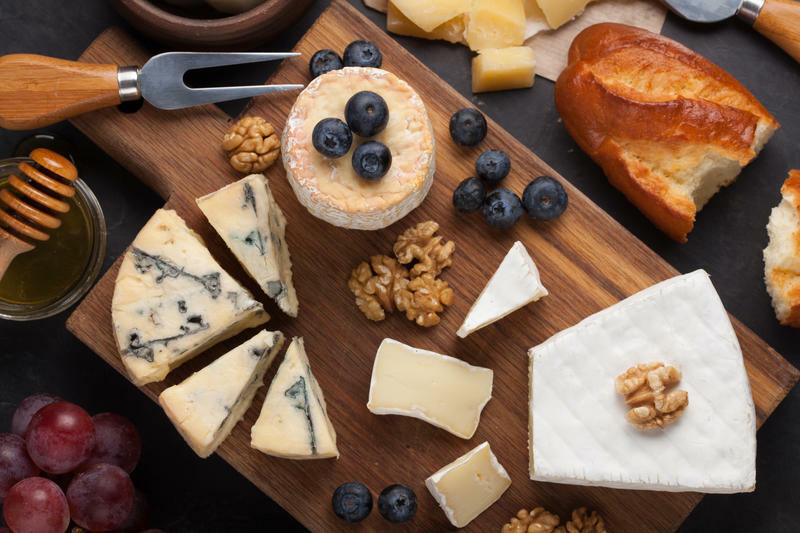 Jeanette Hurt is Lake Effect's regular ambassador to the world of Wisconsin cheeses, and she joined Mitch Teich in studio to talk about the art of pairing cheese with tea. While that may seem odd to some, Hurt says that pairing cheese and tea is very similar to pairing cheese with a wine. Food writer Jeanette Hurt covers the Wisconsin cheese industry and occasionally visits the Lake Effect studio to offer some suggestions for your next get-together or even your next grilled cheese sandwich. Hurt suspects that 2018 will be a big year for artisan and flavored cheese. "Not cheddar or colby, but the really good cheeses," she says. "The one's that have really interesting flavors." Specialty cheese production in Wisconsin increased by seven percent last year, Hurt says, and will more than likely continue to grow. For the first time in nearly three decades, a cheese from the U.S. has won the World Championship Cheese Contest. The Grand Cru Surchoix is made by Emmi Roth USA, a company based in Fitchburg, Wisconsin. 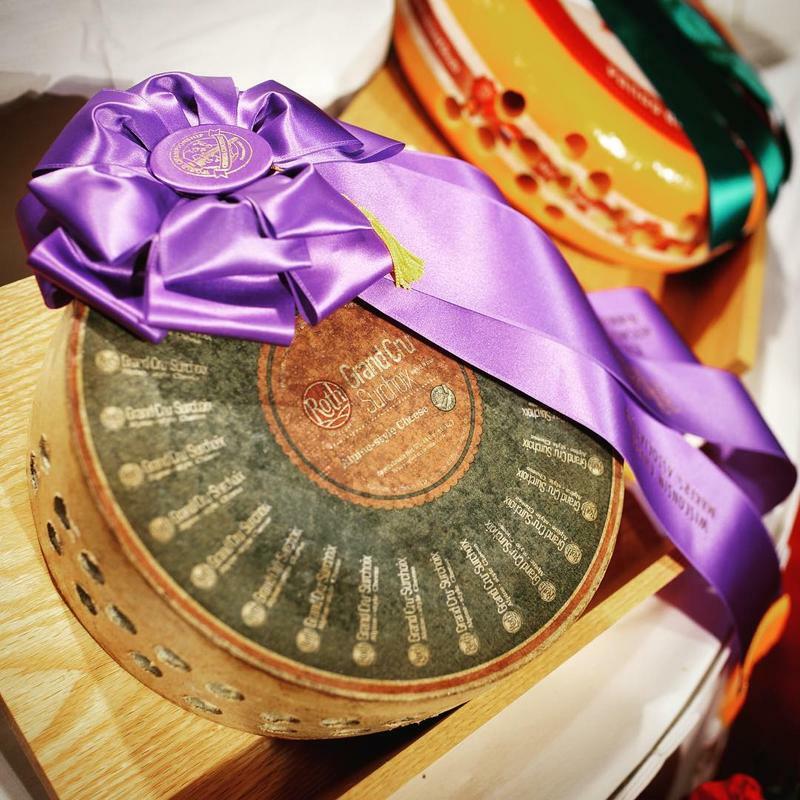 It was proclaimed the best cheese in the world in a contest held earlier this month in Madison. "It just kinda goes to show how hard it is to compete at this stage and win," says Robert Frie, director of operations at Emmi Roth USA.